Dressed for warmth and riding his reindeer stallion, Zugzwang's First Move shows the right way to get into the festive spirit! 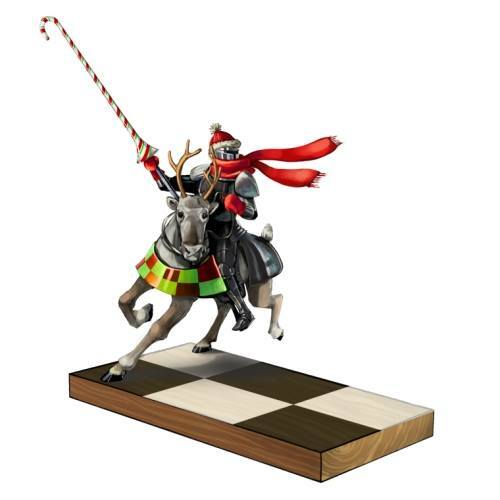 The Festive Zugzwang's First Move Skin can be used on Zugzwang's First Move. The trap's stats (power, power bonus, attraction bonus, etc.) are not changed. The Festive Zugzwang's First Move Skin may be made available during the annual Great Winter Hunt event and can be traded on the Marketplace or through Give To Friends. 10 December 2013: The Festive Zugzwang's First Move Skin was released at the start of the Great Winter Snowball Fight event. It could also be obtained from the Festive Skin Pack (either by direct Donation or from the Marketplace). This page was last edited on 9 December 2017, at 11:56.